Take the lead in your field. Choose NFPA® Lead Membership for the ultimate access to codes and standards, best-in-class training, and a worldwide network of safety expertise. NFPA members play a vital role in advancing our mission to prevent injury and loss around the globe. 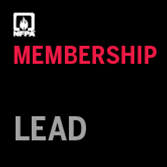 Now, there’s no better way to connect, learn, and contribute to building a safer world than with all-new NFPA Lead Membership. This enhanced membership opportunity prepares you to excel in a leadership role, both in your community and in the industry at large. NFPA Lead Membership combines the power of the National Fire Codes® Subscription Service (NFCSS™) with the benefits of NFPA Membership and huge learning discounts: free access to all online courses and 20% off all classroom training. The ability to search across all our documents, create bookmarks, create custom lists, and more! Save 10% on all NFPA products and services, including all NFPA codes, classroom trainings, handbooks, online training courses, and other educational materials. As an NFPA member, you can also join one of 11 NFPA Sections, where you can connect with experts worldwide in your field. Get the most up-to-date news and information, trends, and research across a wide range of industries. Award-winning NFPA Journal is delivered six times a year. Note: NFPA Lead Membership includes regular NFPA Membership in addition to the National Fire Codes Subscription Service (NFCSS), and NFPA online training courses. NFPA Lead Membership does not include live online webinars. Lead Membership is only available to individual members. NFPA® members are invited to maximize their membership benefits by joining one of our industry-specific Member Sections. Section membership is FREE and included with your NFPA membership. Click to learn more.